The Swedish Thrash trio BENEATH was formed back in 1994. Not a lot is known about this band, though. Between 1994 and 2003 the band recorded and released five demos: see here. It wasn’t until 2008 that the band came back together and took the time to work on a first full-length. “Antidote” is the result and came out in March 2014. It’s a self-release, as BENEATH is one of the many unsigned bands out there. The press text also stated that for now there are no plans for a second album, but chances are open. For the recording of the guitar and piano parts, the band got help from several guest musicians. “Antidote” contains nine tracks, totalling a playtime of a good 60 minutes, also due to a few longer songs. Upon looking at the releases on Metal-Archives.com, several tracks seem to be re-recordings of older songs. Whether or not the band re-recorded them as they were back then or reworked those songs a little, is unknown to me. The album kicks off with the fast and pounding Thrash of “Vengeance I Breathe”. Vocally it’s screams all the way. Melody is applied in the chorus, but the vocal input doesn’t change here. It’s nice to hear, though, how the band differentiated the verses from the regular flowing bridge and melodic chorus. Instrumental talk takes over halfway, leading into an übercatchy alternative bridge, before all goes back to normal. It’s not the happiest song ever, but it is very tasty! “Reasons Undefined” begins with a clean guitar lick, advancing into melodic building that could have made this song a Hard Rock / Heavy Metal one. But then it’s Thrash time, unmistakably. Excellent stuff. Simple, but effective. Verse-wise you get pounding music with shouting vocals, which aren’t always spot on, though, but that’s a trivial aspect here. Speed is also of the essence in the chorus, as is melody in this part of the song. Backing vocals add volume to the vocal input. Contrast is created via a clean break halfway, where there’s even room for the acoustic guitar. A howling, melancholic piece is then due. Not what I expected and it doesn’t make the song better, on the contrary even. However, the situation is rectified when the band reverts back to full force. Time for a midtempo, AMON AMARTH, with a touch of PARADISE LOST somehow, kind of song: “Blissfully Numb”. This is how it begins, but soon enough the Thrash riffing is there to take over command. The screams are done as if his life depended on them. After the typical humpa-verses, a dark bridge comes in. Growls and screams reminded me of the Dutch Death/Thrash formation IZEGRIM. The chorus is of the sad and melancholic kind, the vocal input delivered through screams and, yes, singing. And here the AMON AMARTH influence (musically) comes out again. And then back to the violent sounds of Thrash. The screaming, however, does begin to annoy. It’s too much, just like Tobias Sammet (EDGUY, AVANTASIA) singing often too high (overdoing it) on his latest releases. But that’s not all, as the band adds another clean twist leading into straight-forward melodicness and into the solo part. So, aside from the screams, the music is very good! Another long song is “Harvest Of Mankind” with more than 8 minutes. That means you can’t start the song right away, no, you have to gradually build the thing. Calm and atmospheric is the intro, almost like METALLICA’s “The Call Of Ktulu” (album: “Ride The Lightning”, 1984). Steadily more guitar power is added, until the leash starts to snap. The whole erupts not in a violent way like before, but in a slow, yet powerful manner. You could consider this like a mix of KREATOR and METALLICA; the vocals reminiscent of Mille Petrozza and the music reminiscent of the black album. A nice combination, I have to admit. Growls come in in the pounding bridge, while screams take over in the melodic chorus. Halfway it’s time for an alternative bridge, where rhythm dominates, but allows the leads to come through. Slow Death Metal-ish music (see e.g. AMON AMARTH, UNLEASHED, …) is the result with low, growling vocals. There’s even room for a Jazzy trip, fully instrumental. When the power is restored, the music hasn’t changed music, rather the Jazz became more powerful, more Rock/Metal. Yes, screams are present as well, but they don’t fit here. After this long, slow passage, it’s time to get moving. Samples from a war film? It’s got guns, helicopters, … but the music follows the path of sorrow and sadness. All ends with solos. More aggression and destruction is delivered in “Fear Vs Hate”, but not without building the song first, letting it grow, making the listening anticipate the upcoming assault. Vocally the duties shift between screams (verses) and growls (bridge, chorus). And clean singing much later. A rhythmic break is set at some point, after which the music flows onwards, AMON AMARTH-style. After this it’s back to business. Another highlight on this debut album. And buckle up, or remain buckled up, for another fast Thrasher, EVILE-style: “In The Shadow Of The Beast”. Nothing more needs to be said about this entertaining track. So far, it’s been a very enjoyable and neck-wrenching ride, but things get a little less exciting in the over 7 minutes long “Everything Ends”. In comes the piano, an instrument not often used in Thrash songs. Slow, melodic Metal is added and slowly it turns into a firm unity. Clean singing goes well with the music. Growls are also applied, comparable to e.g. AHAB’s (German Doom Metal band) albums. This is, as you might have guessed from the title, not a happy song at all. Less exciting perhaps, but it’s not a bad song. There are different ways of leaving than by being “Killed In The Womb”. Sadly, it does happen in many places in the world. With regards to the song, it’s firm, midtempo rocker. At first. The Thrash reveals itself soon enough, and in that respect it’s not much different from the previous Thrash tracks on “Antidote”. Do notice the acoustic guitar near the end. 😉 Last but not least but not first but not most… “The Antidote”, the title track clocking in after 12 minutes. What does it contain? A melodic beginning that leads into catchy, midtempo Heavy/Thrash Metal. Vocally it’s got screams and even clean singing, Hetfield-like in the verses. The chorus is fast, though. The clean break later on contains drum samples which sound crappy, if I may say so. And the singing at this point is not fitting either. However, when the Metal returns, it has taken on a Blackened shape. Jazz is the chosen direction to let the antidote finish it all off. 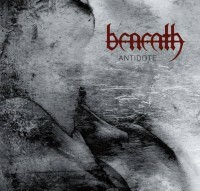 Until this release, “Antidote”, I had never heard of BENEATH. What they offer on their debut album, however, is very tasty Thrash, injected with melody and Death Metal influences. Extreme music requires extreme vocals, and while screams are a possible option, they aren’t always fitting. The music is good to very good, and that more than compensates for the vocal input. Even if BENEATH is said to be a one album project, the lads did a very good job. You can’t really go wrong with this album if you’re looking for a new addition to your collection.